Making the switch to electric shavers can be extremely beneficial for many men, especially in terms of practicality, comfort and even costs. Whether you’re a first time user or simply looking to upgrade your current electric razor, you’ll be faced with the decision of buying a rotary or a foil shaver. 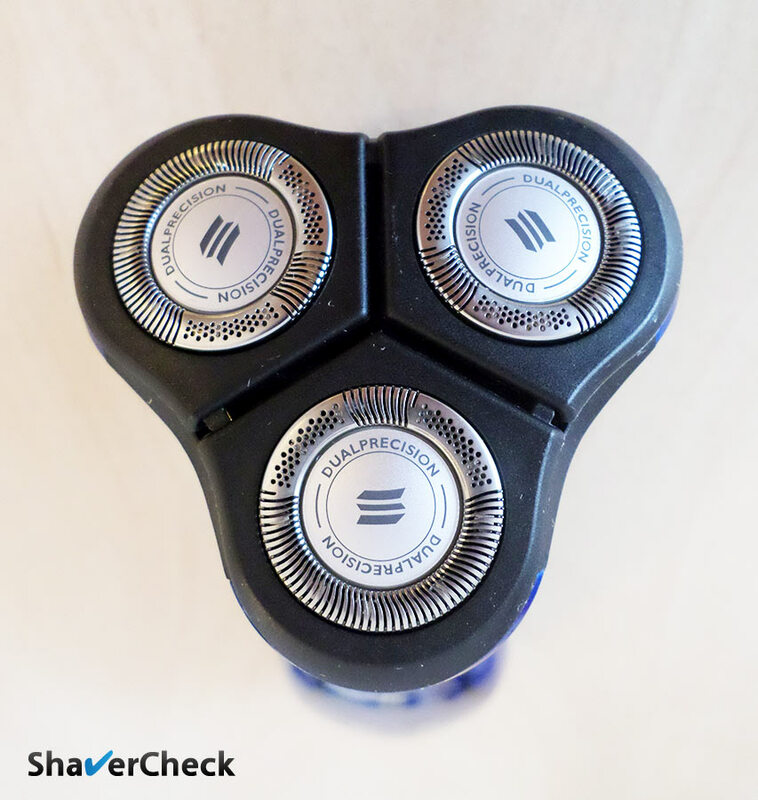 Since you’re reading this article, you probably have already decided that a rotary shaver would be a more suitable option. 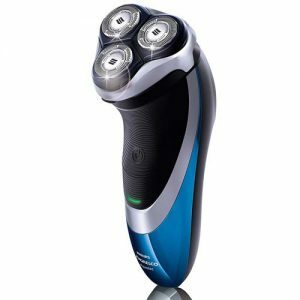 While this ultimately has to do with personal preference and shaving habits, let’s quickly see what they have to offer and how to find the best rotary shaver for you. Advantages of rotary shavers — when should you use one? Rotary shavers work better with thick, longer hairs that grow in different directions. If you shave every two days or more, a rotary razor is probably better suited for you. You can get away with a more sloppy technique when using a rotary shaver, resulting in a faster shaving time. A rotary shaver can cover large areas with ease and are also better suited for shaving the head. Rotary shavers are extremely quiet during operation. What are some of the best rotary shavers out there? Without the intent of transforming this article into a sterile rotary vs foil debate, here are some situations where a rotary razor would be, at least in theory, better suited for the job. One of the situations where almost all electric razors struggle is dealing with long, flat-lying hairs. Things are even worse when the hairs grow in different directions. Since a foil razor requires shaving against the direction of growth, a rotary shaver used with circular, overlapping motions makes it easier for the hairs to enter the slits in the heads and to be cut close to the skin. As stated previously, due to the design and operation of a rotary razor, they usually work better with longer facial hair than their foil counterparts. So if you don’t shave daily, you should consider a rotary shaver. Some advanced foil shavers like the Braun Series 9 work remarkably well when shaving longer beards, but that’s generally not the case. Even basic rotary shavers manage to perform better than similarly priced foil-based razors. While a foil shaver offers more precision and control (and some might say even a closer shave), you have to be more disciplined and patient when using one: short, controlled strokes, always against the grain. Using a rotary razor with circular motions requires less effort and allows you to be less aware of the particularities of the surface being shaved, like the jawline or your chin. Shaving these tricky areas with a foil razor would require multiple changes of direction and angle in order to get a clean shave. Again, due to the way they are intended to be used, rotary razors can be a great option for men that need an electric razor for shaving their head as well. This is probably the only statement from this list that can be objectively verified. Foil shavers have fast motors that oscillate at a very high speed, producing a loud, high pitched whine, while rotary shavers only emit a low hum. There are certainly situations where this aspect can be important — like not wanting to wake up your significant other, your children or roommate. I know I’d take quiet over noisy anytime. While there are quite a few manufacturers of electric razors out there — some of them lesser known to the general public — rotary razors are practically synonymous with Philips Norelco. First introduced in 1939, Norelco has continuously refined and improved the design of its rotary razors and became the undisputed market leader in this segment. In finding the best rotary shaver for you, the most important aspects to consider are cost/performance ratio, availability and cost of replacement blades, wet & dry operation, ease of cleaning and maintenance and, of course, how suitable is a given shaver for your particular needs. 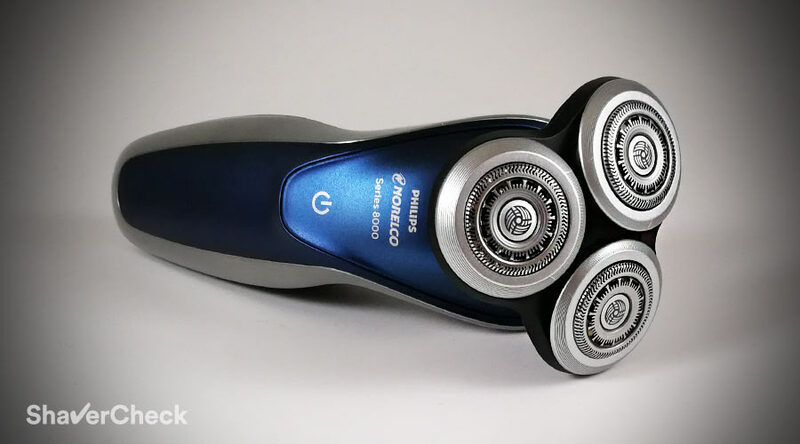 Part of the Series 9000, this particular model from Philips Norelco currently represents the best choice in the high-end rotary shavers segment. If you opt for more expensive models like the 9700 or 9800 you’ll only be paying for features that won’t improve the actual shaving performance at all. Speaking of which, the Philips Norelco 9300 absolutely shines whether you use it wet or dry. It deals impressively well with difficult hair, especially on the neck or right below the jawline. The shaver needs little to no pressure at all for a smooth and irritation-free shave. The highly flexible shaving heads ensure optimal contact with the skin at all times. The Norelco 9300 comes with the SmartClean station that cleans, dries and lubricates the shaver. There’s also a beard trimmer attachment included in the package, very useful for light grooming and touch-ups. While the 9300 offers what is arguably the best shaving experience of any rotary razor, there are still other capable rotary shavers that cost even less. Usually (but not always), the more you pay for a product, the better it is. And this is also the case with electric razors. However, there are times when the extra features of premium products are simply not worth the extra money. With that said, in terms of cost and performance, it’s hard to find a capable rotary razor that will be significantly better than the Norelco 8900 from the Series 8000 line. While most reviews will firmly present Norelco’s flagship Series 9000 as the best rotary razor you can buy, I definitely recommend checking out the 8900 first before spending more than twice the money on something like a Norelco 9700. Allow me to explain why. 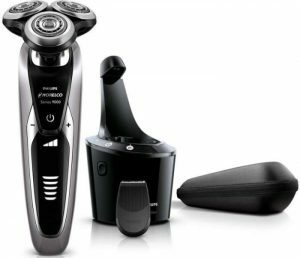 First of all, the Philips Norelco Shaver 8900 uses the same cutters (SH90 replacement heads) as the more expensive Series 9000 models. Secondly, the 8900 can be bought in a variation that includes the SmartClean automatic cleaning system and still costs significantly less than a razor from the Series 9000. Objectively speaking, the only extra features of the more expensive Series 9000 are a personalization mode with three different speeds and a more complex LED display. The 9700 also has a progress indicator for the cleaning cycle that is displayed on the cleaning station. Again, nothing that will significantly improve your experience with that shaver. The 8900 is a very capable razor that should provide a very close and comfortable shave for most men. 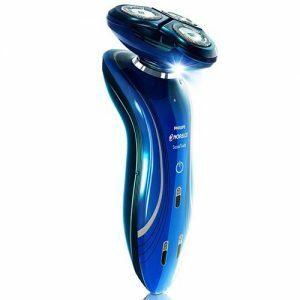 The three cutting heads can independently flex in 8 directions and maintain constant contact with the skin, which translates into an efficient and fast shave and minimizes the number of necessary passes. With its wet & dry operation, the shaver can also be successfully used with shaving cream or gel, further improving the comfort and closeness. Alongside a high-quality travel case, you’ll also find a click on beard trimmer inside the package. While changing accessories can be fiddly, the trimmer attachment for this particular shaver goes one step further than the typical pop-out trimmer you’ll find on most electric shavers that are merely good enough for trimming your sideburns. This is almost a full-fledged beard trimmer with 5 length settings and can even be used for trimming your entire beard. This can be extremely useful when you haven’t shaved in a few days and you need to bring your beard down to a more manageable length before shaving. With the introduction of the new SH90 cutters, the blades can now be individually cleaned and replaced. The transition from the old RQ12 shaving heads to the new RQ12+ or RQ12/62 (that now use the individual SH90 cutters) was met with mixed reactions, especially from long-time Norelco users. Time will tell if it was the right move as both the Series 8000 and 9000 now use them. Considering all the above aspects, I highly recommend checking out the Norelco 8900 as a more cost effective alternative to the Series 9000. For more details, make sure to read my detailed review of the 8900. I definitely consider the 9700 and 9300 to be at least as good in terms of performance, but I just don’t think they have enough compelling extra features to justify the higher price. Another excellent rotary razor in terms of costs and performance is the 6100 that we reviewed in the past. With less rotating blades and a more basic contouring system compared to the Norelco 9300 and 8900 above, the 6100 is still a very capable shaver that fills the gap between Norelco’s absolute entry level shavers and the range-topping models. This razor features a Gyroflex 2D shaving system comprised of three cutting heads that can pivot and tilt inward, as opposed to the more expensive Norelco shavers that can also tilt outward. The cutters are fitted with slots and holes and the double blade setup lifts the hair and cuts it close to skin level. The 6100 also comes with a basic click on trimmer that is handy for light grooming and touch-ups. Another aspect that makes the 6100 a great choice in terms of overall costs is the price of the replacement parts; the RQ11 shaving head is considerably less expensive than the ones used by the Series 8000 and 9000. Thus, the cost of ownership will be minimal. I highly recommend the 6100 for men that shave daily or every two days. For this scenario, it will get the job very well. If however you don’t shave for longer periods of time, have particularly thick stubble or you want the convenience of a cleaning station, the Norelco 8900 presented above will probably be a better option. The Norelco 4100 (formerly PowerTouch with Aquatec 810) has an affordable price, offers cordless, wet & dry operation and its shaving performance will be good enough for most men. The shaver works best when used for shaving daily, be it dry or with a shaving cream or gel. 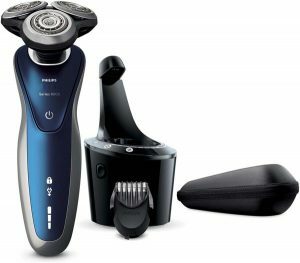 Anyone looking for an inexpensive, robust and versatile rotary shaver should check it out. Being fully waterproof, easy to clean and very simple in design and function, the 4100 also represents an excellent choice for first-time users. 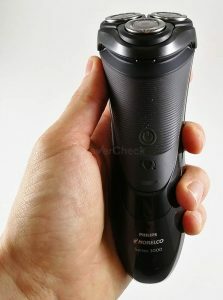 Finally, there’s the Philips Norelco Shaver 3100 (S3310/81) that offers the best bang for your buck. While it lacks the wet & dry operation of the 4100 above, it costs significantly less and most men will shave dry anyway. The Shaver 3100 is a basic, no-frills rotary razor that will get the job done smoothly. As it’s the case with all entry-level razors, the 3100 works best when used more often, even though during my tests it managed to cope remarkably well with longer, flat-lying hairs. The closeness and comfort are adequate, but can’t really match the performance of the high-end rotary razors like the Norelco Series 9000. 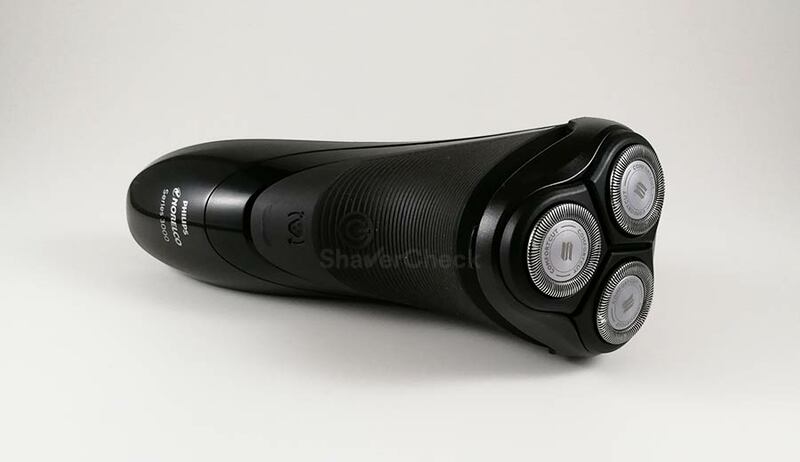 To get all the details make sure to check out my complete review of the Shaver 3100. This pretty much wraps up my top 5 recommendations and will hopefully cater to everyone’s needs for a rotary shaver. There are of course other excellent or similar razors out there, so definitely check out our reviews section as well for in-depth, real-world reviews of the most popular electric shavers. Home » Articles & Guides » Best Shavers » What’s The Best Rotary Shaver For Men (2018)? Thanks for your helpful point can you please elaburate how to clean the heads should it be cleaned by decapping them or wadhig them would be sufficient? Specially the one located in the center . I got a Q-rotary Shaver with 5 heads. can you please elaburate how to clean the heads ? should it be cleaned by decapping each head to clean . or washing them under watet would be sufficient? Specially the one located in the center which doesnt seem to be oppend easily. I haven’t personally used a Q Shaver, so I’m afraid I cannot give you any advice on how to take apart the center shaving head. Your user’s manual should normally include detailed instructions on how to perform this operation. Regarding the actual cleaning, the exact steps and how to perform them when taking apart the shaving heads for a more thorough cleaning will vary for different shavers. I’ve only used Norelco and Remington rotary shavers, so I don’t think it would be of much help in this case. It usually involves removing the shaving head holder, removing a retaining frame that holds the cutters inside the combs and then cleaning the cutters and the inside of the combs one by one, taking extra care not to mix them up. In the case of your shaver this can be different to a less or higher degree. Also, this in-depth cleaning should be performed from time to time, like once every week or two if you don’t have or use an automatic cleaning station. Again, this depends on your shaving frequency and you can do it more or less often. I had an Arcitec Shaver, used the now discontinued RQ 10 replacement head. I bought a 7000 series razor which isn’t as good as the Arcitec. Why did Norelco Philishave discontinue the RQ10? Haven’t enjoyed a shave since then. first wanted to congratulate You for this site. 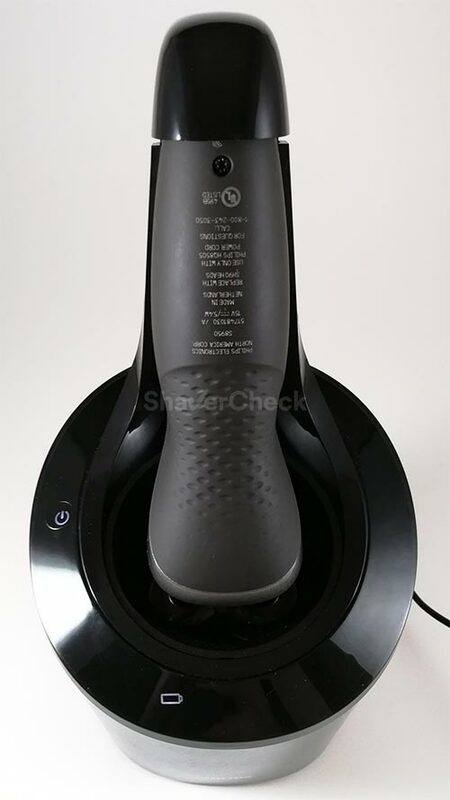 I have a question regarding new Philips Star Wars edition of rotary razor – SW6700. Have You checked that out or will You check it in near future? What’s interesting in this little fellow – same shaving head as 9000. Also I believe it uses the same replacement blades as SH90. Instead of personalization mode it has turbo mode, probably known from 5700. I was wondering about razors performance because in my country You cannot find 8900 so there is no cheaper 9000 alternative and maybe SW6700 could be one (around 110$). Thank you for your comment. I haven’t tried the SW6700 yet, but its performance should be similar to the 8900. You are correct, they use the same cutting heads as the Series 9000. For $110 I would say that it looks like a good deal as well. Hi, could you include Philips AquaTouch S5070? It’s so hard to find decent review of this particular type. I haven’t got the chance to try that one yet, so I’m afraid I cannot help you. First of all, amazing articles!! !, this place is the shaver heaven! !, thanks for share. I am searching for a new shaver, actually, I have an HQ6950 which is more than enough (I don’t have a lot of beard, in fact, I shave every 3 days my mustard and I use the pop up trimmer every 5 days. I am planning to buy a 4100 and a Multi Groomer MG3750. What do you think? I also thought in a foil shaver buy I never had one and for the mustard maybe the rotary is better. Thank you for the kind words, Santiago. Since you were pleased with the HQ6950, going for another rotary shaver is probably the right thing to do. The 4100 is a very good shaver in its price category and I think it’ll serve you well.